In this article, Stibel talks about attracting customers and increasing revenue by having a strong network. He brings it back to the ant colony that he references in “Breakpoint,” noting that an ant colony knows it’s the strength of the network that matters, not the size. To learn more about building a strong network in order to help grow a business, read Stibel’s full post here. Jeff Stibel, author of Breakpoint, talks with MoneyBeat host Paul Vigna about Facebook’s future, and why constant growth is not only unsustainable, but also counterproductive to longevity. Recently, two Princeton graduate students released a study predicting the demise of Facebook by 2017, using concepts from epidemiology. No quicker had the media reported the results of the study than numerous rebuttals were posted. A few Facebook data scientists had great fun by posting their analyses showing that Princeton University would run out of students by 2021 and that the Earth would run out of air by 2060. Read the whole article where is originally appeared. Last week, Twitter’s stock took a big tumble after it released its first quarterly earnings report. The report showed that revenue is up (and better than expected), but user growth is slowing and engagement is down. Declining user growth is not an issue in itself, and actually can be a great thing for a network (in fact, I wrote a whole book on this topic). Lack of engagement, on the other hand, is something different. Read the whole article where it originally appeared. Last month, Apple CEO Tim Cook announced the long-anticipated iPhone 5S, and also a second product, the iPhone 5C, with a suggested retail price starting at $99. While Cook later argued that the 5C was not intended to be an entry-level device, it is clear that the less expensive device—Wal-Mart is currently selling it for $49—could enable less affluent customers to join the Apple family. Basic economics strongly support this reasoning: demand for a product or service goes up as the price goes down. Keep prices low; encourage high demand. But oftentimes, lower prices have a paradoxical effect. In fact, lower cost is often equated with cheap, and nothing could be worse for Apple than having that association. It is one of the reasons that Steve Jobs always priced his products higher than others, even at the risk of losing market share. The alternative to reducing prices is to eliminate them entirely. For many products and services, it’s not acceptable for the price to be low: it must be free. Apple may have been better served by giving the iPhone 5c away for free. Read the whole article on LinkedIn, where it originally appeared. When I was five, I wanted to be a pop star princess who saved the world. Talk about big dreams. But before you judge, I bet when you were five you had dreams of being something as awesome as a pop star princess. All things start small. Every adult starts off as a child, just like every big business starts as a small one. Children have huge hopes and dreams for when they grow up, just like small businesses have aspirations to thrive and grow to larger businesses. The twist is that a business’s size isn’t just relative to other businesses. The size of a business is determined by the size of the general market it serves. Thus, a business that appears small may actually be the largest form of that business that the market it serves can support. To learn more about network and market size relativity, get your copy of Breakpoint today! If all businesses depend on networks and all networks inevitably hit a breakpoint, do all businesses hit a breakpoint? Correct answer: A. All businesses hit a breakpoint. No network is invincible. No, not even yours. But fear not! 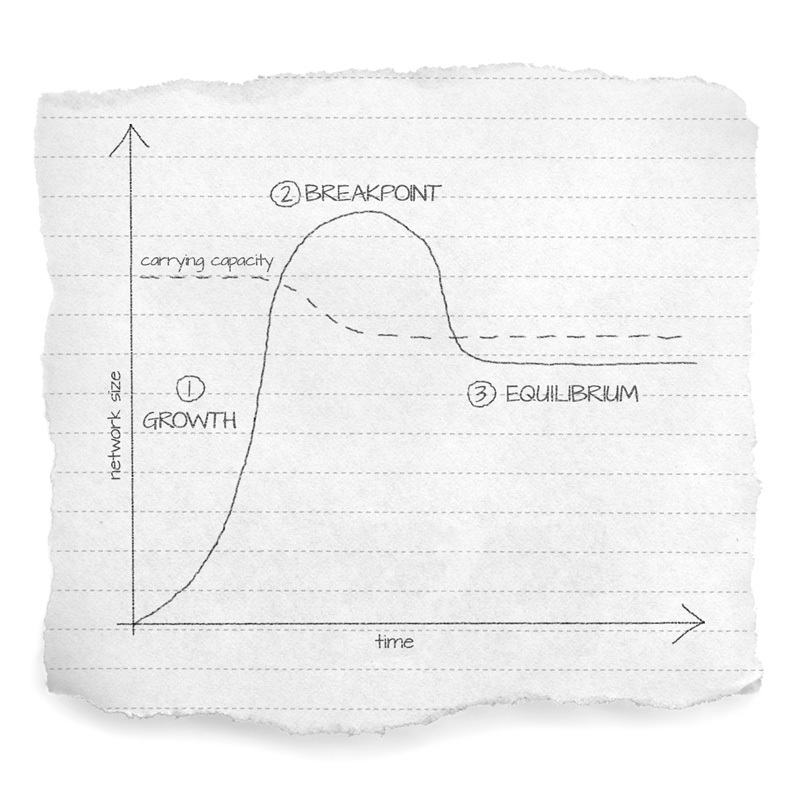 Your breakpoint is not an ultimatum, there are ways to survive your company’s breakpoint. Once a company hits it’s breakpoint (the point in which it fully saturates it’s network and exceeds it’s carrying capacity) it can either collapse or recover. Your breakpoint can be hugely enlightening for your business and you can gain crucial intelligence and stabilize. To learn how you can survive your company’s breakpoint, get your copy of Breakpoint today! There are countless examples of companies whose life cycles can be represented by the adjoining graph. There is the period of rapid growth, after which the company hits a peak, then settles into a plateau or state of equilibrium. At this point, shareholders start to get worried, share prices go down, and everyone begins to speculate about the future of the company. The following article explains why this process is natural, and almost essential for a long life cycle of any company. These periodic slowdowns are inevitable, though management can and should strive to make decisions that slow down the decline and reverse it quickly. In order to make these decisions, it is crucial to understand the forces responsible for slowing down these seemingly unstoppable companies. Communication: from early man’s grunts to languages and Facebook, Twitter and Smartphones! Currently the internet attempts to make sense of 8,512 computer languages, dozens of HTML-based web languages, and nearly 6,500 active spoken human languages. Communication originates from the brain. We communicate within our minds using electricity electrical neuronal spikes. This is the starting point of any forms of communication. We know what it sounds like: neuronal spikes sound like static crackling. This is the fundamental building block of language. If we can take this and map it to the fundamental building block for how the internet and computers communicate, we’d have the foundations to make translations at the root level of thought. Computers and transistors communicate using the same electrical currents that neurons do. Language tends to form before the breakpoint and this is a primary reason why so many companies are rushing to hire linguists: they see the opportunity but they also know it may slip away.